Two things that really sell me on a product are *New* and/or *Limited Edition*. This qualified under *New* to me, and my intrigue level was HIGH. 1 – It comes with a suction cup hook to dry it and leave it in the shower. For sanitary reasons, I like the idea of a sponge air drying rather than laying in a flat dish to dry. 3 – The price is $12 regularly, $9 with free shipping if you are a Julep Maven (monthly subscription box). Most konjac sponges I found were in this $10 price range, not sure why the Boscia one is almost double. Update: I found a new konjac sponge that I am obsessed with and it’s only $5. It’s amazing and gives me flawless results. It’s all I buy now! 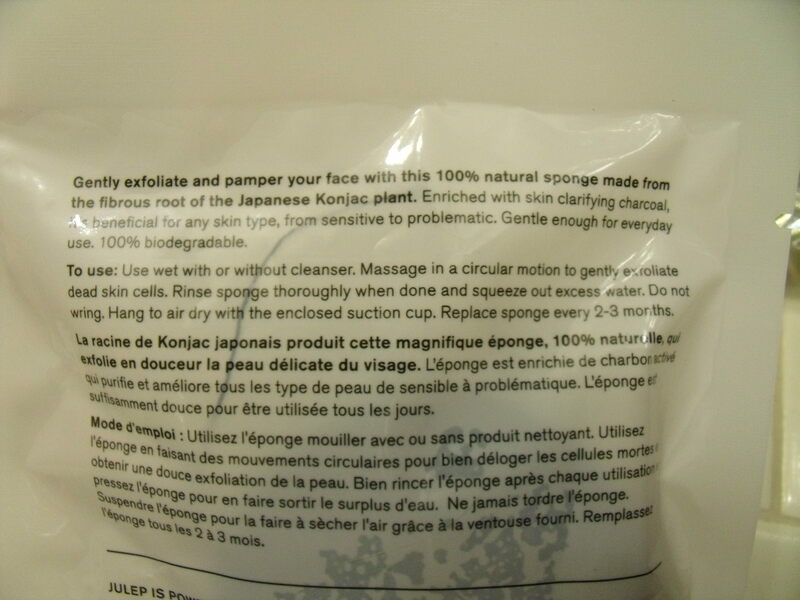 WHAT THE HECK IS A KONJAC SPONGE? Ok, so from my bountiful Internet Research here is what I have learned. A konjac sponge is an all natural fiber taken from the root of a konjac plant. It feels like a marshmallow that has pores. When you first take it out of the bag, it’s damp and a bit slimy, (don’t be scared!). After rinsing it, it really feels like a bouncy marshmallow. The texture is addicting! These sponges are gentle enough to be used daily and on even the most delicate baby skin. They work for all skin types. For real. You can purchase them infused with different things for different skin conditions. My Julep one has added charcoal, which is a natural anti-bacterial agent. Need to be replaced every 2 to 3 months. You can microwave the sponge on medium in a bowl of water to sanitize it, but I’m a psuedo-hippie and don’t have a microwave 🙂 so I might try “boiling” mine in medium heat water on the stove once every couple of weeks to keep it sanitary. Konjac sponges were originally developed in Japan and became really popular in Japan and Korea. They are biodegradable, meaning when you throw it out, you aren’t junking up a landfill with something that will never breakdown. Did I mention all natural? Huge plus, as I’m really trying to move towards using all natural products. It’s so hard when you love *New* and *Limited Edition*. I want to try everything! I use my sponge at night, to exfoliate before bedtime, approximately 5 times a week. I leave my sponge on the hook in the shower. I use my DHC Deep Cleansing Oil first to take all my makeup off. Then I thoroughly soak my konjac sponge in medium temperature water to bring it back to it’s bouncey texture. I don’t add any additional cleansers to the sponge. I tried using it with my Juice Beauty face wash and prefer the konjac sponge on it’s own, after I’ve rinsed off my cleansing oil. I use the round side over my face, neck, and upper chest area. Then, using a light circular motion, I use the oval pointed side and gently rub the sides of my nose, around my mouth, and the sides of my nose close to my inner eyes. Then rinse my sponge again and gently squeeze the water out by placing the sponge flat in between the palms of my hands and pressing the sponge flat, then hang it back up to dry. Don’t twist or ring the sponge to dry because you’ll tear the fibers and rip the sponge in half. Just gently press and you’ll be A-OK.
Wow. This thing is incredible. I am especially in love with the tapered oval end. In only two uses, it completely cleared up the small white bumps on either side of my nose at the inner corners on my eyes. 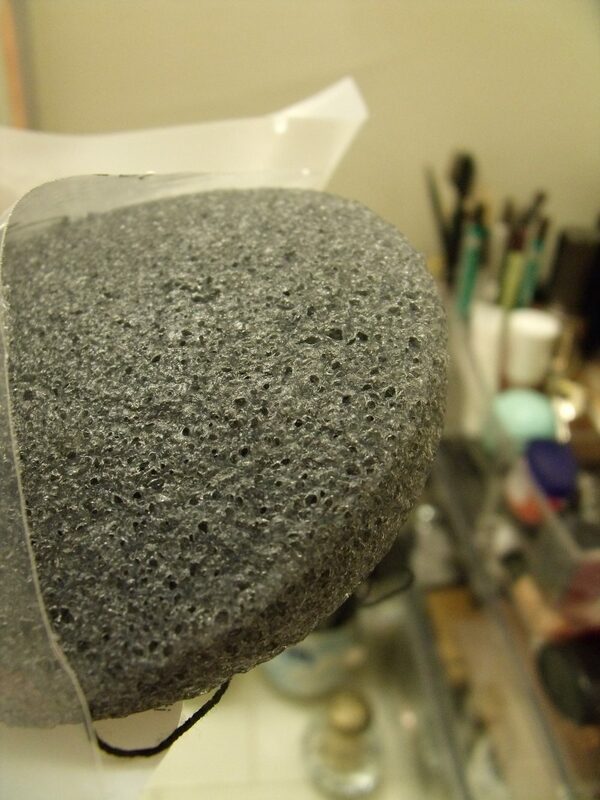 I could not fit my cleansing brush in there before, but this sponge is perfect. I also use the tapered side for the curves of my nose and the skin there and around my mouth is now so smooth! My skin overall is much softer and my fine lines look softer, almost airbrushed or photoshopped. The lines are still there, don’t get me wrong, but they definitely look softer and lighter. My skin looks really glowing. This is the most gentle exfoliating product I’ve ever used. I have dry skin, so I’m careful about how much I exfoliate. The konjac sponge is my new skincare fav because of how gentle it is. My makeup also goes on more smoothly and looks better because of the exfoliation. Konjac sponges are super affordable, incredibly gentle, and great for all skin types. I am absolutely in love with mine. Sorry the lighting is a bit different between the two photos! 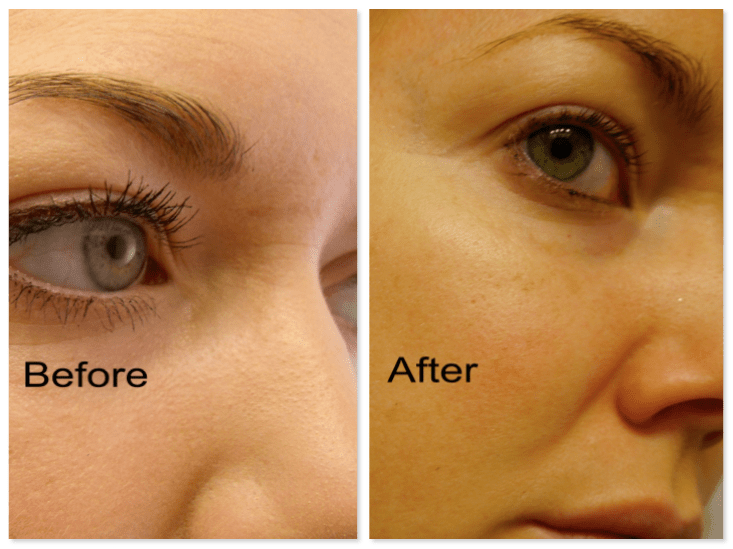 But I think the “Before” best shows the texture and pores, and the “After” photo shows the change in pores and the glow. Brush On Block: Hype or Truth? As always, thank you for reading and being a part of the blog! 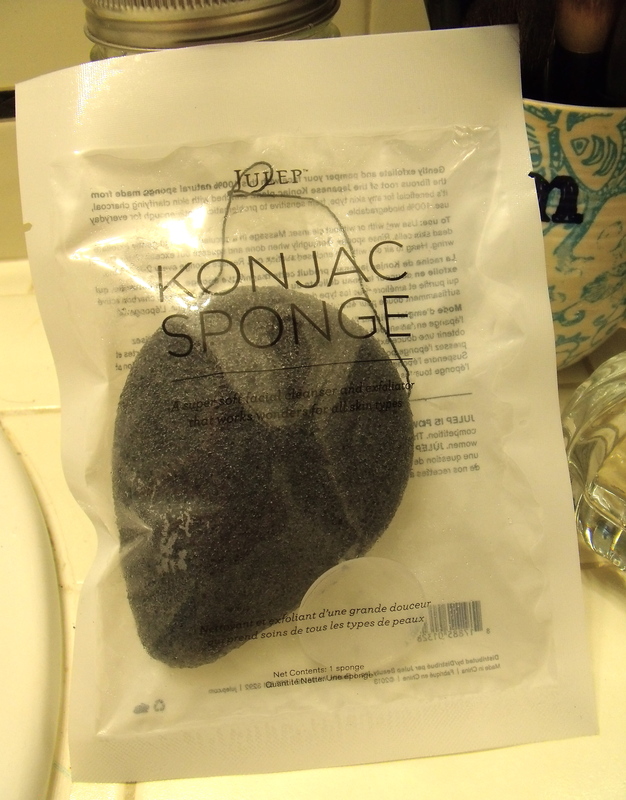 I hope this post was helpful, I love konjac sponges. They really changed my skin. Please let me know if you try one! I had no idea what these were before, but now… That sounds pretty awesome! I’ll have to stop avoiding the Julep one and try it out – thanks! I’m so glad this helped! I was really curious before I got one too, now I can’t go without it!! ULTA has a similar one for $6 listed as “Charcoal Vegetable Body Sponge” but it is a 100% Konjac sponge. Oh rad! I was wondering why I hadn’t seen any in stores. Maybe they are just labeled differently. Did you try it? I did. I’ll admit that I wasn’t crazy about it at first because it has that marshmallow, slimy feel but you do get use to it. I’m growing use to it and starting to like it. I know! I am now fully addicted to that weird texture. Must have.